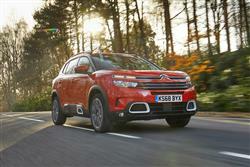 In a C5 Aircross, according to Citroen, you'll be travelling 'Premier Class'. So what exactly, does that mean? Something significant surely, given that this car's main selling point is a unique 'Progressive Hydraulic Cushion' suspension system. This car also introduced dashcam technology to the mid-sized SUV segment. And provides a decent blend of economy and performance in the 2.0-litre BlueHDi 180 diesel form we're going to look at here. The legendary Citroen 2CV had a reputation for being able to comfortably traverse a ploughed field. That apart though, this French brand can't call on much customer recognition when it comes to vehicles cable of functioning off the beaten track. A decade or so back, there were two re-badged Mitsubishi models, the C-Crosser and a car we didn't get, the C4 Aircross. 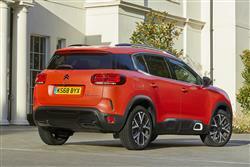 But that's been about it from Citroen when it comes to mid-sized contenders of this kind. This has to change of course, given the current European obsession with SUVs and the company is depending on its Aircross range of models to convince customers of its crossover credibility. Here, we're looking at the mid-sized C5 Aircross, tested in this case in BlueHDi 180 2.0-litre diesel form. As with other variants in the C5 Aircross range, this one's most unique selling point is a clever new suspension system but there's also lots else of note, as I found out throughout a week at the wheel. 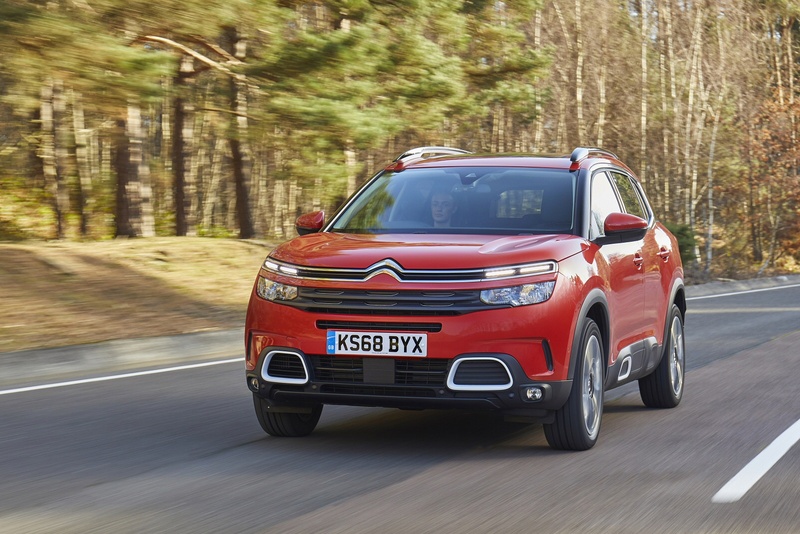 The 2.0-litre BlueHDi 180 diesel engine is one of the more powerful powerplants in the C5 Aircross range - the other is the 1.6-litre PureTech 180 petrol unit. Both powerplants only come with Citroen's smooth-shifting EAT8 8-speed auto transmission and get a a largely irrelevant 'Sport' button on the centre console that ramps up engine noise but not a lot else. 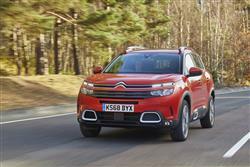 Engine noise isn't something you really want to hear more of in a diesel, especially not from Citroen's 2.0-litre BlueHDi 180 unit, which is one of the brand's older engines. It's quite a lusty lump though, developing 400Nm, which is why this variant can offer easily the highest braked towing capacity in the range - 1,650kgs. And get from rest to 62mph in 8.6s - which is over 3 seconds quicker than a BlueHDi 130 auto model can manage. The top speed is 131mph. As with other C5 Aircross variants, ride quality here is embellished by a clever 'Progressive Hydraulic Cushions' suspension system which delivers class-leading comfort over poorer surfaces. Hydraulic dampers cushion the top and bottom of wheel travel at the top and bottom of wheel travel and allow the fitment of softer springs and dampers, producing what the brand describes as a 'magic carpet'-like feel. Citroen's had to think carefully about the design positioning of this car to avoid trespassing on the territory of the four other PSA Group mid-sized SUVs that already campaign in various parts of this one's chosen segment. This C5 Aircross is a five-seat design but quite a large one, with a 4.5-metre length that makes it a fraction bigger than the Gallic conglomerate's two other five-seat contenders in this sector (the Peugeot 3008 and Vauxhall Grandland X) but a fraction smaller than PSA's seven-seat offerings in the class, Peugeot's 5008 and the DS 7 Crossback. Inside, as with most modern Citroens, what you find is a mixture of interesting design, a few cheaper plastics and some clever electronics. Oh and lovely seats, with the ones you're most likely to get being of the generously proportioned 'Advanced Comfort' variety, which feature particularly broad bases, foam that's 15mm thicker than usual for extra support and extra quilted padding. The result is a feeling of cosseting Gallic luxury. The instrument binnacle is another cabin talking point, conventional dials completely replaced by a standard 12.3-inch colour screen that's fully configurable and customisable. Just about everything else you'll need to know can be found on the 8-inch centre-dash capacitive touchscreen. In the back seat you'll get what Citroen claims is the 'most modular' rear bench arrangement in the class. It's certainly very versatile, made up of three individual sliding, folding and reclining seats. Out back, you get a large 580-litre boot. The BlueHDi 180 version of this C5 Aircross comes only in mid-range 'Flair' or top 'Flair Plus' guises, and that means list prices starting at just over £30,000. Still, you get a lot of kit with these spec levels. 'Flair grade models are recognisable by '18-inch 'Swirl' alloy wheels, rear privacy glass and chrome-effect exhaust trim. There are some key extra interior features at this level, amongst them the more supportive 'Advanced Comfort' seats and the 'Citroen Connect Nav' sat nav system that comes with 'TomTom Live' traffic updates and voice recognition. Plus there are useful features like front parking sensors, a 180-degree 'Visio Park' colour reversing camera, an electrochrome rear view mirror, a two-tone horn and 'follow-me-home' lighting that at night guides you to your front door. The cabin gets a classy upgrade too, the 'Metropolitan Grey Ambiance' package you get at this level giving you upholstery trimmed in a mixture of Grey Grained leather and 'Graphite' cloth. At 'Flair' level, you also get as standard what is probably this C5 Aircross model's most unexpected feature - the 'ConnectedCAM', the world's first built-in dashcam system. With this, you get an integrated camera with a 128Gb memory that's positioned in front of the rear view mirror housing, giving the lens a 120-degree view of what's ahead of the car. We're used to modern Citroens being rather light by class standards, particularly models that are, like this one, built upon the PSA Group's stiff, sophisticated EMP2 platform. 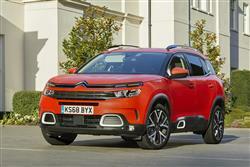 So the news that the fastest and best-equipped versions of this C5 Aircross tip the scales at well over 1.5-tonnes may prepare you for the fact that in trading up from the brand's smaller C3 Aircross model (which is a massive 400kgs lighter), your running cost returns are going to be very different. Of course, many C5 Aircross buyers won't be switching from something smaller in the Crossover class and these people will merely be happy to see that this car's efficiency stats number amongst the better readings that you can expect to get from a mid-sized volume brand SUV of this kind. In evaluating them, we'll quote you figures based on readings calculated using the latest 'WLTP' ('World harmonised Light vehicle Test Procedure') cycle, but the stats have been converted back to the most recent 'New European Driving Cycle' 'NEDC2' spec, since that's what a lot of rival models are still using. This 2.0-litre BlueHDi 180 diesel powerplant returns up to 47.1mpg and up to 124g/km. If you�re looking for a new Citroen C5 Aircross 2.0 BlueHDi 180 Flair Plus 5dr EAT8 Diesel Hatchback for sale, you�ve come to the right place. At Bristol Street Motors we don�t just have the best Citroen C5 Aircross 2.0 BlueHDi 180 Flair Plus 5dr EAT8 Diesel Hatchback deals, we also offer friendly advice and help with all your enquiries to ensure your buying experience is a happy experience.